Baptism is one of two sacraments practiced at Grace Congregational Church. Baptism is a gift from God when we believe the Holy Spirit comes upon the water and those being baptized. The act of baptism marks the beginning of new life of discipleship with Christ, it is the human response to the gift of salvation. Who is baptized in the United Church of Christ? Infants, children and adults are all recipients of God’s grace through Christian baptism. If parents choose to have their infant or child baptized, we expect the child to be raised in a Christian community of faith. Parents should be active members of a church when they request the sacrament of baptism. 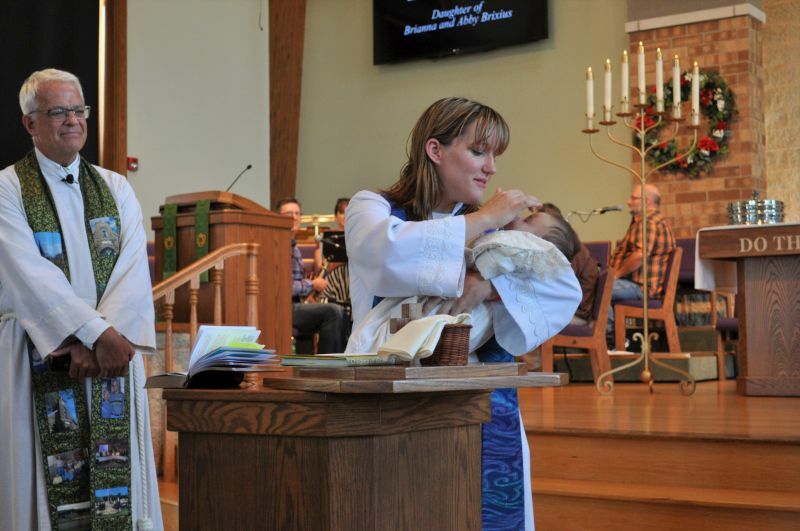 How does baptism take place at Grace Congregational Church? We strongly recommend that the sacrament of baptism be performed during a Sunday morning service of Christian worship. The worshiping community is referred to as ‘the Body of Christ’, a sign of God’s presence in our midst. We discourage private baptisms. What customs are associated with baptism? It is customary for a baptismal candidate to be surrounded by sponsors or god parents. This pertains to all forms of baptism. It is our expectation that a god parent is an active member of the church, and will nurture the spiritual growth of the baptismal candidate. What promises are spoken at baptism? Parents—Do you desire to have your child baptized into the faith and family of Jesus Christ? Parents and God Parents—Will you encourage your child to renounce the powers of evil and to receive the freedom of new life in Christ? Will you teach this child that they may be led to profess Jesus Christ as Lord and Savior? Parents, God Parents and/or Baptismal Candidate—Do you promise, by the grace of God, to be Christ’s disciple, to follow in the way of our Savior, to resist oppression and evil, to show love and justice, and to witness to the work and word of Jesus Christ as best you are able? Do you promise, according to the grace given you, to grow (with this child) in the Christian faith, to (help this child to) be a faithful member of the church of Jesus Christ, by celebrating Christ’s presence, by furthering Christ’s mission in all the world, and by offering the nurture of the Christian church (so that s/he may affirm her/his baptism)?